Médecins Sans Frontières (MSF) has filed a ‘patent opposition’ in India to prevent US pharmaceutical company Pfizer from getting a patent on the pneumococcal conjugate vaccine (PCV13), so more affordable versions can become available to developing countries and humanitarian organisations. This is the first time a vaccine (biosimilar) patent has been challenged in India by a medical organisation, with the goal of millions more children being protected against deadly pneumonia. Pneumonia is the leading cause of childhood death, killing almost one million children each year. Currently, pharmaceutical companies Pfizer and GlaxoSmithKline (GSK) are the only two manufacturers of the vaccine, which could prevent a large number of these deaths. Pfizer has priced PCV13 (marketed as Prevenar) out of reach of many developing countries and humanitarian organisations. It is now 68 times more expensive to vaccinate a child than in 2001, according to a 2015 MSF report, The Right Shot: Bringing down Barriers to Affordable and Adapted Vaccines. The pneumonia vaccine accounts for almost half the price of vaccinating a child in the poorest countries. “The pneumonia vaccine is the world’s best-selling vaccine, and last year alone, Pfizer brought in more than US$6 billion dollars in sales just for this product—meanwhile many developing countries, where millions of children risk getting pneumonia, simply can’t afford it,” said Dr Manica Balasegaram, Executive Director of MSF’s Access Campaign. One vaccine producer in India has already announced that it could supply the pneumonia vaccine for $6 dollars per child (for all three doses) to public health programmes and humanitarian organisations like MSF. This is almost half the current lowest global price of $10 dollars per child, which is only available to a limited number of developing countries via donor funding through Gavi, the Vaccine Alliance. In 2015, all 193 countries at the World Health Assembly passed a landmark resolution demanding more affordable vaccines and increased transparency around vaccine prices. “Last year, more than 50 countries spoke out against high vaccine prices and about the difficulties of introducing new vaccines, including Indonesia, Jordan and Tunisia. We can’t wait any longer for all countries to be able to afford this vaccine,” said Balasegaram. The pre-grant opposition—a form of citizen review at the patent examination stage—submits technical grounds before the patent office to show that claims that cover a certain aspect of a drug or vaccine do not merit patenting under India’s Patents Act. An equivalent patent to the one opposed today in India was already revoked by the European Patent Office (EPO) and is currently being challenged in South Korea. Pfizer’s patent application involves the methods of conjugating 13 serotypes of streptococcus pneumonia into a single carrier. “Our pre-grant opposition shows that the method Pfizer is trying to patent is too obvious to deserve a patent under Indian law, and is just a way to guarantee a market monopoly for Pfizer for many years to come,” said Leena Menghaney, Head of MSF’s Access Campaign in South Asia. “India must rebuff demands from pharmaceutical companies, which are backed by diplomatic pressure tactics of the U.S. and other governments, that India change its patentability standards to restrict generic competition. After years of fruitless negotiations with Pfizer to lower the vaccine’s price for use in its projects, MSF is challenging this patent application in India to ensure that manufacturers who are planning to produce the pneumonia vaccine do not face key patent barriers at the time of launching a more affordable version. This week, MSF’s Access Campaign launched an upgraded version of the Patent Opposition Database, an online resource for civil society and patient groups in developing countries that enables sharing of technical information related to legal challenges of unwarranted medical patents. The web-based searchable database, which already contains technical documentation for more than 100 patent oppositions relating to key medicines, now offers improved collaboration tools and easier searching. Each year, MSF teams vaccinate millions of people, both as outbreak response to diseases such as measles, meningitis, yellow fever and cholera, as well as routine immunisation activities in projects where it provides health care to mothers and children. In 2014 alone, MSF delivered more than 3.9 million doses of vaccines and immunological products. MSF has purchased the pneumococcal conjugate vaccine (PCV), used to protect against pneumonia, in the past for use in its emergency operations. MSF is scaling up its use of PCV and other vaccines with a particular focus on improving its work in routine immunisation, as well as extending the package of vaccines used in humanitarian emergencies. MSF has vaccinated children caught in emergencies with PCV in Central African Republic, Ethiopia, South Sudan, and Uganda, among others. 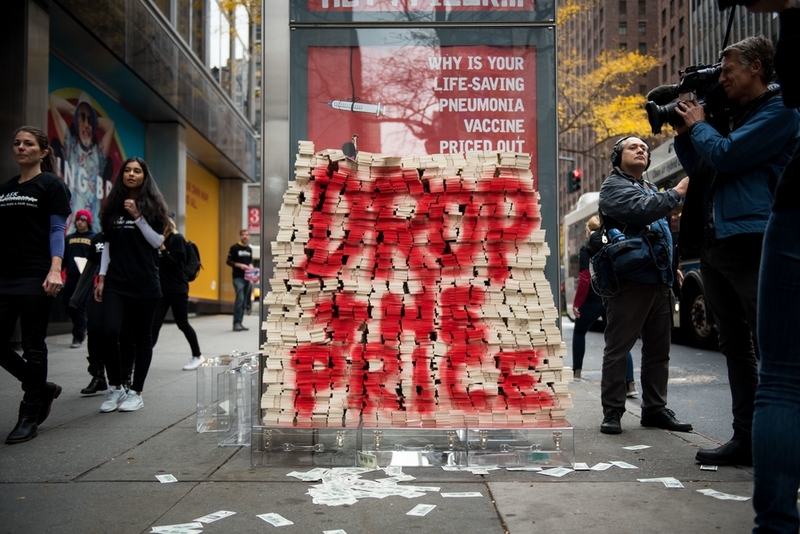 In 2015, MSF launched its ‘A FAIR SHOT’ campaign to push for pharmaceutical companies Pfizer and GSK to reduce the price of the pneumonia vaccine to $5 per child for all three doses.